This week, we see an odd reunion of one of Marvel’s oldest superhero teams: The Invaders! Originally composed of Captain America, Bucky, Prince Namor, and Jim Hammond AKA the original Human Torch, the Invaders invariably fought the Nazis and other members of the Axis powers back in the second World War. 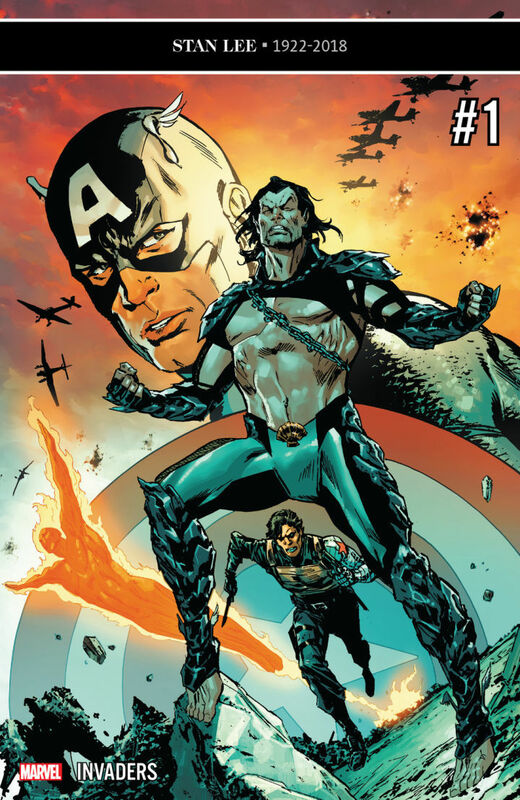 Now, Bucky is a reformed cyborg assassin, Namor’s responsible for crimes against humanity, and Cap is still shaking off the stigma of the fact that an alternate version of himself almost led Hydra to take over the world. Hammond, though, has begun work on a memoir of the Invaders’ old exploits, wanting to capture Namor’s true self rather than a trumped up boogeyman. Captain America, in turn, reminisces about the man Namor once was, as he recalls a particular tragic exploit during the Invaders’ time together in World War II. In the meantime, the sea king of Atlantis himself is forcefully rejoining the remnants of his kingdom: his plan and his sanity are in question. Overall it was a prime first issue, which honestly surprised me. Zdarsky is nailing these characters so far: Jim is a humble and simple android, Cap is a conflicted man trying to come to terms with confusing situations (and confusing former friends), and Namor is equal parts heroic and sinister. And, really, would we have the King of Atlantis any other way? Other characters, unfortunately, don’t get as much development or time on-panel, which may be a little disappointing to some readers. The emotional complexity and intensity revolving around Namor, however (aided even more in the role Cap’s memories of him play), more than made up for it. In my eyes, at least. The art is twofold in this issue, as we have Carlos Magno dealing with scenes set in the present day, as Butch Guice deals with scenes set in World War II, the setting of Cap’s aforementioned flashbacks. They both work well enough and are appropriate for their respective time periods. Magno’s work is crisper and cleaner, befitting of a modern and complex world of superheroes. Guice’s art, meanwhile, is comparably rougher and grittier style evokes an atmosphere similar to old war photographs from that era. And he excels at it: you’ll never have expected anyone to accomplish the feat of making a fishman in a speedo not look out of place next to an American World War II soldier, but there it is.